This circuit will take you through two amazing kingdoms, Buganda and Ankole kingdom. Visitors will take you through Buganda trail, drum making villages, bark clothing and wind up in Mgahinga national park with the first people, the Batwa. Welcome to the land of a million hills aka Switzerland of Africa-Kibale! Today you will enjoy the Batwa Trail, a firsthand introduction to one of the most unique cultures worldwide. The Batwa pygmies are a forest people displaced from the rain forest they shared with mountain gorillas. This experience will give you the opportunity to learn more about their age old culture while you enjoy a hike with the Batwa guides, see how they lived and hunted, hear ancient legends and learn about medical plants. Guests are finally invited to the sacred Ngarama Cave, once home to the Batwa King, where the women of the community perform a sorrowful song which echoes eerily around the depths of the dark cave, and leaves guests with a striking and moving sense of the richness of this fading culture. The revenue generated from these activities directly benefits the Batwa to strengthen their community. In the morning you will join our guide on a shopping spree visit Kampala African craft markets including Buganda road, Banana boat, and the one behind national theater. 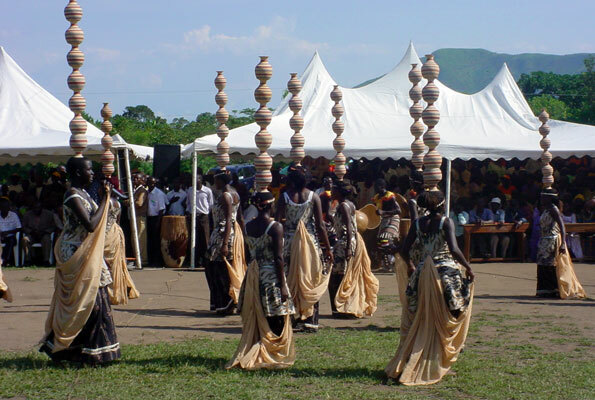 We will wind off the evening at Ndere cultural centre and witness Uganda’s Cultural Ambassadors. The multi-award winning Ndere Troupe has been gracing stages for almost 25 years with high quality performances that have resulted in worldwide appreciation and fame. Ndere Troupe has also made memorable experiences for countless people and organizations by performing at the different milestones in their lives.